Dining in the Victorian and Edwardian Eras was a popular form of entertainment. Breakfasts, lunches and dinners could last several hours, and entertainment in the form of music, or dancing, was provided in the wealthier homes. 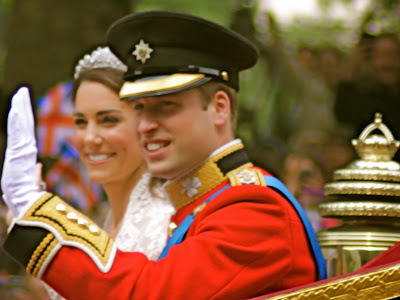 Also in the wealthier homes, one would find a vast array of silver dining implements and utensils at each place setting. Having the newest designs for the most obscure foods that could be purchased, was a way of exhibiting one upmanship with one's peers. The designs and patents for utensils and other silver marvels for the table were plentiful. Some were over-the-top in design, while others were much more utilitarian in nature. After all, one does need to eat, and if a utensil's design was functional, easy to use and pleasing to the eye, it was a hit with consumers. Green corn on the cob was very popular in the Victorian Era, and it's popularity continued well into the Edwardian Era and beyond. The difficulty, as with today's corn on the cob, was in serving the corn, and eating the corn, without looking like a complete buffoon and making a spectacle of oneself in the process. 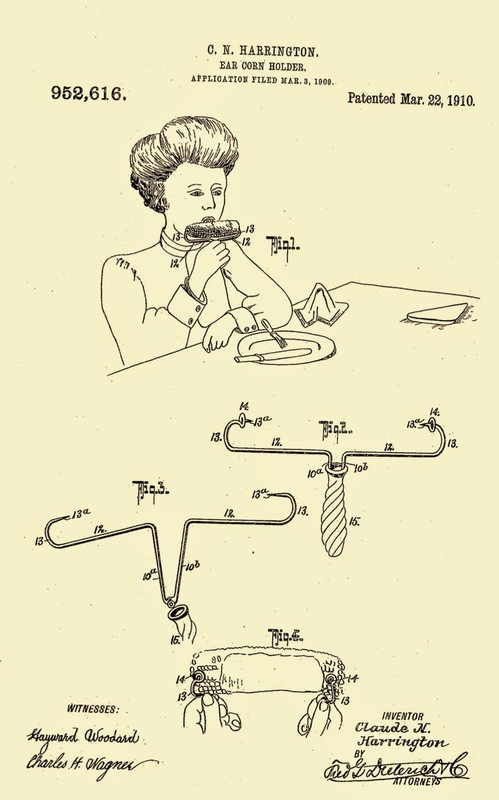 Below is a list of etiquette tips, along with a sampling of some of the more creative items designed for eating corn. 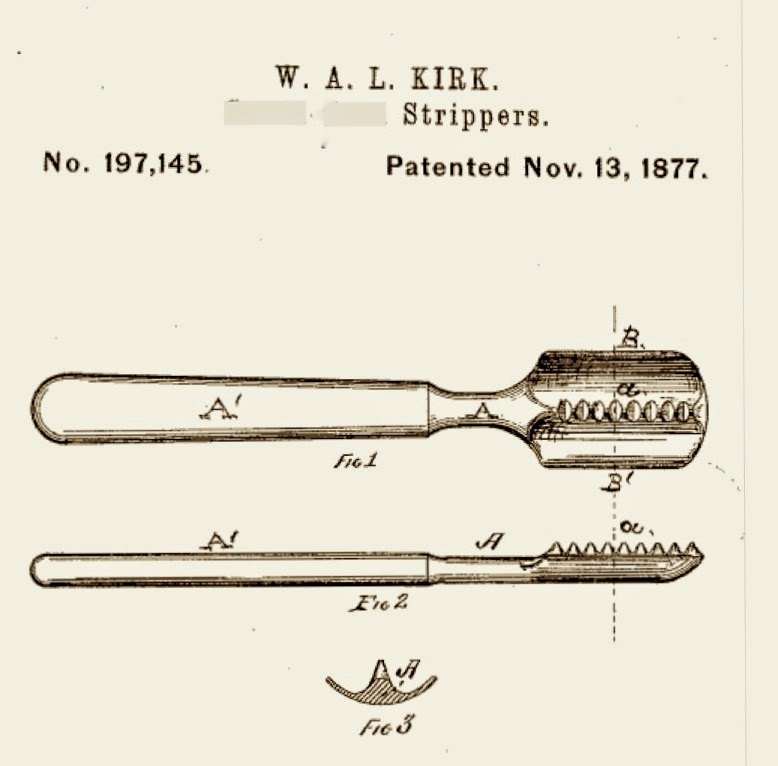 1877 patent- Green corn scrapers or "strippers" were popular items for those who did not wish to deal with the mess of eating corn off of the cob. 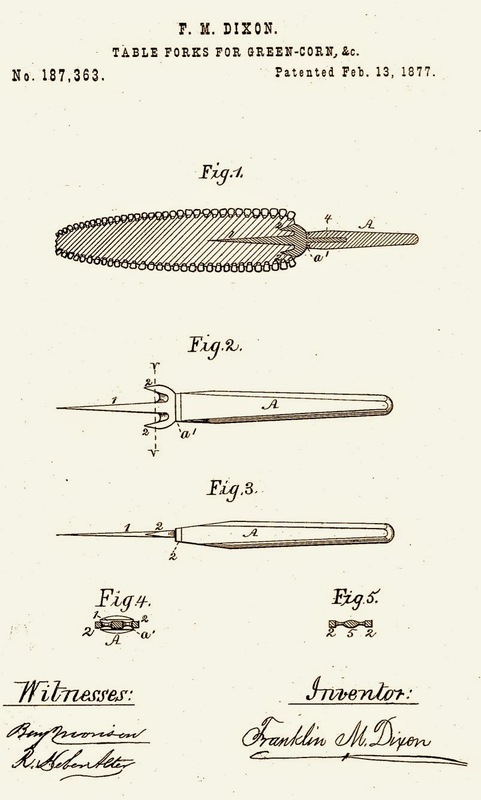 A "Green Corn Fork" also patented in 1877. This looks much like mango forks of today, and also like corn holders that were popular up until the 1920s, but with much longer handles. 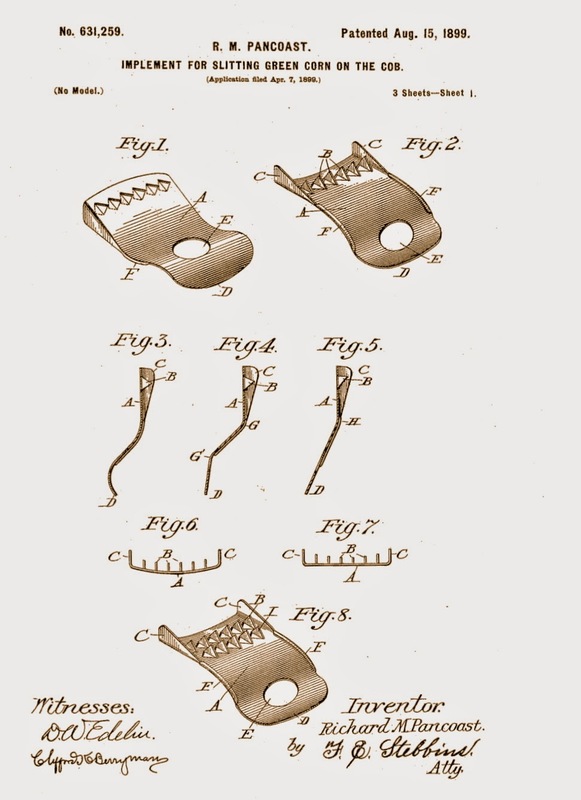 An 1899 patent for a corn slitter which shows the "teeth" as the Victorian designed corn slitter, or scraper, at the very top of the page does not. The "teeth" scraped the corn off of the cob so that one could eat the kernels with one's fork. A rare Gorham corn holder from 1901, in the Florentine pattern. Note the man's face on the end of the handle. 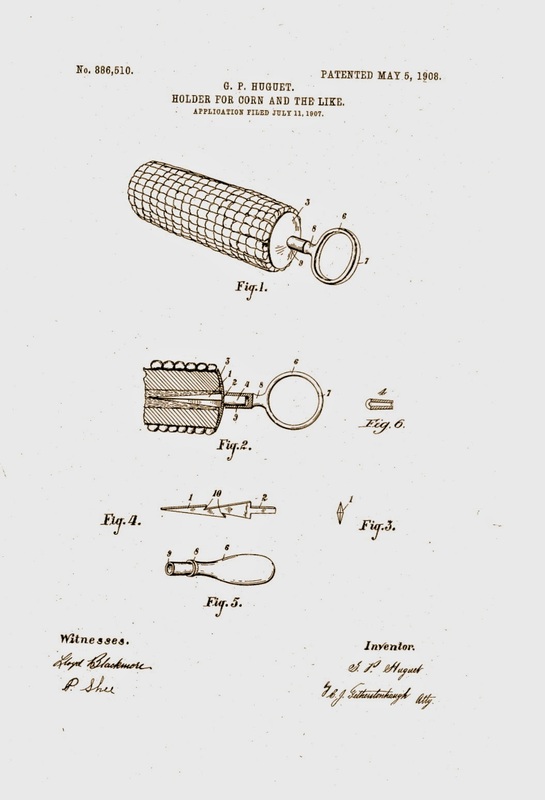 A green corn fork patent applied for in 1907 and granted in 1908. This fork has teeth! It may have been functional, but was probably hazardous to the mouth. 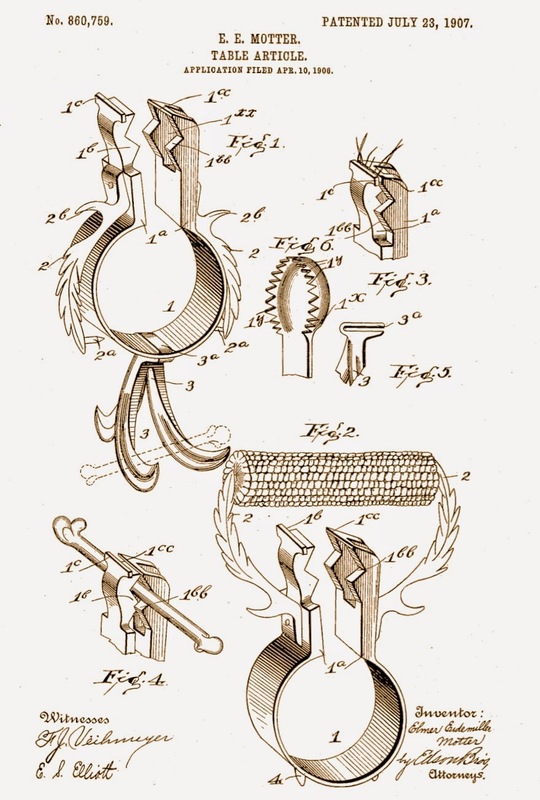 A patent for a 1909 "Ear Corn Holder." Artists were not well paid at the time, and tended to make many mistakes when it came to etiquette. This woman is shown exhibiting two dining faux pas; eating with her elbow on the table, and her napkin still sits on the table as well. Kudos to the artist who got the rest positions for the knife and fork almost perfect, but what else was she eating that required either utensil? Her plate was clean. 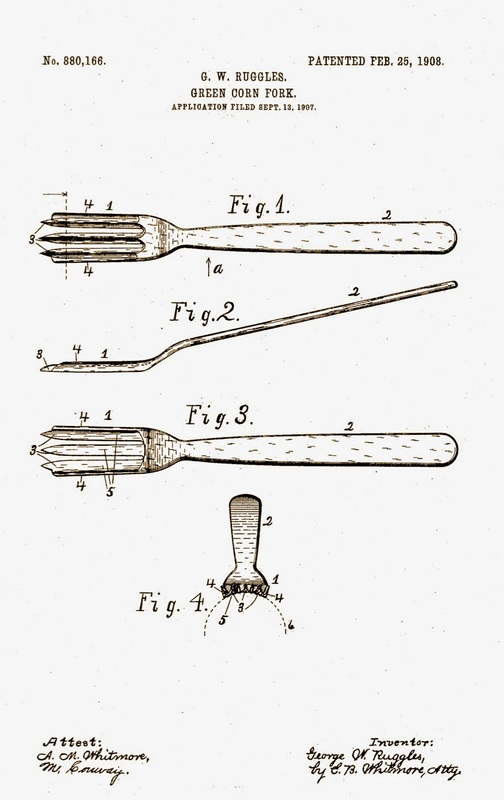 An 1899 corn slitter or scraper, a 1921 corn fork, designed with one slightly sharper edge and tines, to not only scrape the corn off of the fork, but to eat the corn as well, and a 1925 patented "Ear Corn Server." 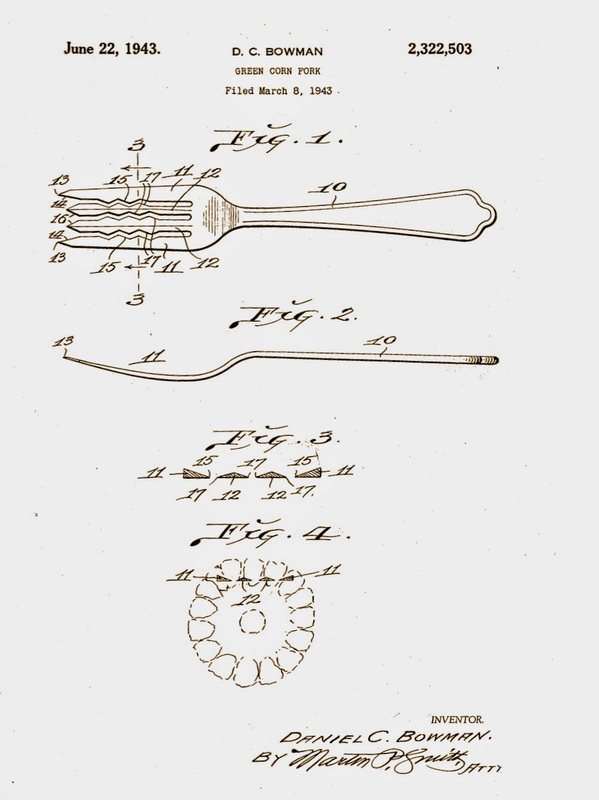 Another patent for a "Green Corn Fork" but this one is from 1943. Do not butter the entire ear before eating. Butter and/or season only a few rows of corn at a time if you can. Hold the corn ﬁrmly by the ends or skewers, or holders with both hands, if it is not too hot. Eat a few rows from left to right at a time. Do not eat in a circle or ring around the corn. Do this as neatly as you can without making loud sounds. Remember to wipe your mouth with your napkin after setting the cob or ear down. Do not pick at your teeth unless you leave the table. If you need to remove corn stuck between teeth, do so in private. If you have used butter, please make sure your hands are clean before touching other items on the table, so as not to leave a mark or make a mess. Contributor Maura Graber has been teaching etiquette to children, teens and adults, and training new etiquette instructors, for nearly a quarter of a century, as founder and director of The RSVP Institute of Etiquette. 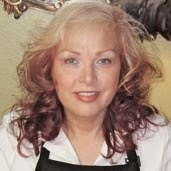 She is also a writer, has been featured in countless newspapers, magazines and television shows and was an on-air contributor to PBS in Southern California for 15 years.